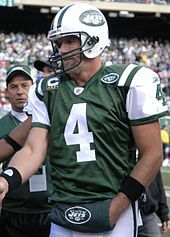 Brett Lorenzo Favre (/ˈfɑːrv/ ( listen); FARV; born October 10, 1969) is a former American football quarterback who spent the majority of his career with the Green Bay Packers of the National Football League (NFL). He was a 20-year veteran of the NFL, having played quarterback for the Atlanta Falcons in 1991, Packers from 1992 to 2007, New York Jets in 2008, and Minnesota Vikings from 2009 to 2010. Favre was the first NFL quarterback to pass for 500 touchdowns, throw for 70,000 yards, complete 6,000 passes, and attempt 10,000 passes. A graduate of the University of Southern Mississippi, Favre played college football for the Southern Miss Golden Eagles for four years, setting many school records. He was selected in the second round of the 1991 NFL Draft by the Falcons, with whom he spent one season as a backup before being traded to Green Bay for the Packers' first-round pick in the 1992 NFL Draft. Favre became the Packers' starting quarterback in the fourth game of the 1992 NFL season and started every game through the 2007 season. He played for the Packers for 16 years before being traded to the Jets for the 2008 season and spending his final two seasons with the Vikings. In that time, he made an NFL-record 297 consecutive starts, 321 including the playoffs. Favre's eleven Pro Bowl invitations is the third most among quarterbacks in NFL history. He is the only player to win the Associated Press NFL Most Valuable Player Award three consecutive times, doing so from 1995 to 1997, and is one of only six quarterbacks to have won the award as well as the Super Bowl in the same season. He led teams to eight division championships, five NFC Championship Games, and two Super Bowl appearances: Super Bowl XXXI and Super Bowl XXXII. He and the Packers won Super Bowl XXXI over the New England Patriots. 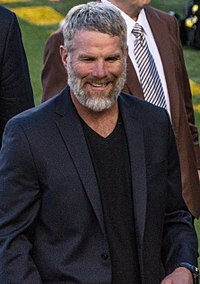 Favre holds many NFL records, including most career pass attempts, most career interceptions thrown, most consecutive starts by a player, most times sacked, and most fumbles. At the time of his retirement, he was the NFL's all-time leader in passing yards, passing touchdowns and quarterback wins; all three records have since been broken by Peyton Manning and Tom Brady respectively. Favre was inducted into the Pro Football Hall of Fame in 2016. 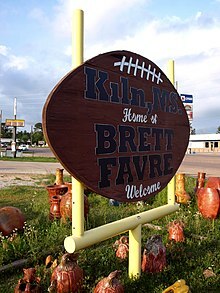 Favre grew up in the small Mississippi gulf town of Kiln. Brett Favre was born in Gulfport, Mississippi, the son of Bonita Ann (née French) and Irvin Ernest Favre, and raised in the small town of Kiln. Both of his parents were schoolteachers in the Hancock County School District. He is of part French ancestry. One of his ancestors is Simon Favre, a Creole, was an influential figure in Spanish West Florida in the late 18th and early 19th centuries; Brett descends from Simon's Choctaw Native American mistress, Pistikiokonay, and thus his grandfather was affiliated with the Choctaw. Brett was the second of four children and attended Hancock North Central High School, where he played baseball and football. Favre started for the Hancock North Central baseball team as an eighth-grader and earned five varsity letters. He played quarterback, lineman, strong safety, placekicker, and punter in a primarily option, run-oriented offense coached by his father, Irvin Favre, who was the head coach of the Hawks football team. Favre spent his early years on the North Central Hancock High School football field, where his throwing ability led to a Southern Miss. scholarship. After high school, Southern Mississippi offered Favre a football scholarship at the urging of assistant coach McHale, which was the only one he received. Southern Miss wanted him to play defensive back, but Favre wanted to play quarterback instead. Favre began his freshman year as the seventh-string quarterback and took over the starting position in the second half of the third game of the year against Tulane on September 19, 1987. Favre, despite suffering a hangover from the night before and vomiting during warm-ups, led the Golden Eagles to a come-from-behind victory with two touchdown passes. Favre started ten games during his freshman year and won six of them. In his junior season, Favre led the Golden Eagles to an upset of #6 Florida State on September 2, 1989. Favre capped a six-and-a-half-minute drive with the game-winning touchdown pass with 23 seconds remaining. On July 14, 1990, before the start of Favre's senior year at Southern Miss, he was involved in a near-fatal car accident. When going around a bend a few tenths of a mile from his parents' house, Favre lost control of his car, which flipped three times and came to rest against a tree. It was only after one of his brothers smashed a car window with a golf club that Favre could be evacuated and rushed to the hospital. In the ambulance, his mother was sitting with him. "All I kept asking [her] was 'Will I be able to play football again?'" Favre recalled later. Doctors would later remove 30 inches (76 cm) of Favre's small intestine. Six weeks after this incident, on September 8, Favre led Southern Miss to a comeback victory over Alabama. Alabama coach Gene Stallings said, "You can call it a miracle or a legend or whatever you want to. I just know that on that day, Brett Favre was larger than life." Favre formerly held several Southern Miss football records until most were surpassed by Austin Davis by the end of the 2011 season. Favre had 15 games over his career where he compiled more than 200 passing yards, making him fourth in school history on the all–time list in that category. Of those 15 games, five were 300-yard games, the most compiled by any of the school's quarterbacks. Additionally, he was the seasonal leader in total passing and total offense in all four of his seasons at Southern Miss. Favre earned a teaching degree with an emphasis in special education from the University of Southern Mississippi. Favre was drafted by the Atlanta Falcons in the second round with the 33rd overall pick in the 1991 NFL Draft. On July 19, 1991, Favre agreed to a three-year, US$1.4 million contract with a reported signing bonus of $350,000. Atlanta head coach Jerry Glanville did not approve of the drafting of Favre, saying it would take a plane crash for him to put Favre into the game. Favre's first pass in an NFL regular season game resulted in an interception returned for a touchdown in a game against the Washington Redskins. He only attempted four passes in his career at Atlanta, was intercepted twice, and completed none of them. Favre took one other snap, which resulted in a sack for an eleven-yard loss. On February 11, 1992, Green Bay Packers general manager Ron Wolf traded a first-round pick (19th overall, which would be used for running back Tony Smith) to the Atlanta Falcons in exchange for Favre. Wolf, while an assistant to the general manager of the New York Jets, had intended to take Favre in the 1991 NFL Draft, but Favre was taken by the Falcons on the previous pick. According to the Milwaukee Journal-Sentinel and other sources, during the physical after the trade, Favre was diagnosed with avascular necrosis of the hip, the same degenerative condition that ended running back Bo Jackson's football career, and doctors recommended his physical be failed, which would nullify the trade. Wolf overruled them. Favre played 16 seasons in Green Bay. During his time with the Packers, Favre was the first and only NFL player to win three consecutive AP MVP awards. He helped the Packers appear in two Super Bowls, winning Super Bowl XXXI and losing Super Bowl XXXII. Favre started every Packers game from September 20, 1992 to January 20, 2008, a streak of 253 games. The record would continue after he left the Packers, reaching 297 games in the regular season. This remains the all-time record for consecutive starts in the NFL. In the second game of the 1992 season, the Packers played the Tampa Bay Buccaneers. The Buccaneers were leading 17–0 at halftime when head coach Mike Holmgren benched starting quarterback Don Majkowski and Favre played the second half. On his first regular season play as a Packer, Favre threw a pass that was deflected by Buccaneers player Ray Seals and caught by Favre. Favre was tackled and the completion went for −7 yards. The Packers lost the game 31–3, chalking up only 106 yards passing. In the third game of the 1992 season, Majkowski injured a ligament in his ankle against the Cincinnati Bengals, an injury severe enough that he would be out for four weeks. Favre replaced Majkowski for the remainder of the game. Favre fumbled four times during the course of the game, a performance poor enough that the crowd chanted for Favre to be removed in favor of another Packers backup quarterback at the time, Ty Detmer. However, down 23–17 with 1:07 left in the game, the Packers started an offensive series on their own 8-yard line. Favre then completed a 42-yard pass to wide receiver Sterling Sharpe. Three plays later, Favre threw the game–winning touchdown pass to wide receiver Kitrick Taylor with 13 seconds remaining. The next week's game against the Pittsburgh Steelers began the longest consecutive starts streak for a quarterback in NFL history. The game ended in a 17–3 victory and his passer rating was 144.6. During the season, Favre helped put together a six-game winning streak for the Packers, the longest winning streak for the club since 1965. They ended 9–7 that season, missing the playoffs on their last game. Favre finished his first season as a Packer with 3,227 yards and a quarterback rating of 85.3, helping him to his first Pro Bowl. The following season, Favre helped the Packers to their first playoff berth since 1982 and was named to his second Pro Bowl. Favre had his first career 400 yard passing game and led the NFC in pass attempts, pass completions, and pass interceptions. Favre also had four game winning drives giving him seven for his career up to that point. After the season, Favre became a free agent. General manager Ron Wolf negotiated Favre into a five-year, $19 million contract. The Packers finished the 1994 season with a 9–7 record, advancing to the playoffs in back to back years, a feat they had not accomplished since the Vince Lombardi era. For the first time in his career, he was not eligible for the Pro Bowl. In 1995, Favre won the first of his three AP MVP awards. Favre led the Packers to an 11–5 record, Green Bay's best record in nearly thirty years. Favre passed for a career-high of 4,413 yards, 38 touchdowns, and recorded a quarterback rating of 99.5, which was the highest of his career until he recorded a rating of 107.2 during the 2009 season. Favre also tied an NFL record by passing for at least two touchdowns in twelve consecutive games, a feat he accomplished over the 1994–1995 seasons. The Packers advanced to the NFC Championship Game after upsetting the San Francisco 49ers in the NFC Divisional Game. The Packers lost the NFC Championship game to the Dallas Cowboys, marking the third year in a row the Packers season was ended by the Cowboys in the playoffs. Favre helped the Packers advance farther in the playoffs than any other Packer team since 1967, which was the season the Packers last won the championship in Super Bowl II. While being treated for various injuries, Favre developed an addiction to Vicodin, which became publicly known when he suffered a seizure during a hospital visit. Amid an NFL investigation, he went public to avoid any rumors about his condition. In May 1996, he went into treatment and remained in rehabilitation for 46 days. Had he chosen not to go, the NFL would have imposed a $900,000 fine. Favre led the Packers to their best season in 30 years in the 1996 season, winning his second consecutive MVP award in the process. The Packers led the NFL in points scored (456) as well as fewest points allowed (210), joining only the 1972 Dolphins as the only two teams to ever accomplish this. The defense also set a then NFL record for least amount of touchdowns allowed in a 16-game season with 19. Favre threw for 3,899 yards, a career-high 39 touchdown passes (third highest ever at the time), only 13 interceptions, and passer rating of 95.8 (the third highest of his career). Green Bay tied the Denver Broncos for the NFL's best regular season record, 13–3, defeated the San Francisco 49ers (35–14) and Carolina Panthers (30–13) at Lambeau Field in the playoffs. The Packers advanced to Super Bowl XXXI at the Louisiana Superdome, a short drive from Favre's hometown. In Super Bowl XXXI, Favre completed 14-of-27 passes for 246 yards and two touchdown passes. On the second play of the game, Favre called an audible and threw a 54-yard touchdown pass to wide receiver Andre Rison. In addition, Favre completed an 81-yard touchdown pass to wide receiver Antonio Freeman in the second quarter (then a Super Bowl record for longest touchdown catch). Favre rushed for 12 yards and another touchdown, as the Packers won Super Bowl XXXI over the New England Patriots, 35–21. In their 19 games of the season, the Packers had a turnover differential of plus 24, and outscored their opponents 100–48 in the playoffs. Favre became the first quarterback to score three touchdowns in the Super Bowl and fail to win MVP honors. Favre and the Packers continued their dominance of the NFC during the next season. Favre was named AP co-MVP of the league along with Detroit Lions' running back Barry Sanders, his third straight award. He finished the season with 3,867 passing yards, 35 touchdown passes, 16 interceptions, and a passer rating of 92.6. The Packers finished with a 13-3 record and became the only team to ever defeat six teams that would go on to make the playoffs. Also, Green Bay advanced through the playoffs to the Super Bowl for the second year in a row. After being heavily favored by 11 points, the Packers lost to the Denver Broncos in Super Bowl XXXII by the score of 31–24 at Qualcomm Stadium in San Diego, ending the NFC's 13-year Super Bowl winning streak. Denver defeating Green Bay was one of the biggest upsets in NFL history. Favre completed 25-of-42 passes for 256 yards and three touchdowns, with one interception and one fumble in the losing effort. Super Bowl XXXII was Favre's last appearance in a Super Bowl in his career. The Packers lost to the San Francisco 49ers in a Wild Card Round playoff game in 1998. Favre had rallied the team with a touchdown pass to wide receiver Antonio Freeman with 1:56 remaining in the game to put the Packers up 27–23. However, Steve Young responded with a touchdown of his own to wide receiver Terrell Owens with three seconds remaining to end the Packers season. Favre and the Packers failed for the first time since 1994 to at least reach the NFC Championship. In the regular season finale of 2001, Favre was the target of minor controversy when, in a game against the New York Giants at Giants Stadium, he was sacked by the Giants defensive end Michael Strahan. It was Strahan's lone sack of the game and gave him the NFL's single–season sack record of 22.5, which topped Mark Gastineau's record of 22 set in 1984. The controversy (Favre fell over unusually easily) has followed Strahan continuously since he set the record. Jim Fassel, Strahan's coach in 2001, said that when a respected athlete like Strahan gets close to an all-time record, sometimes opponents want him to break it. On March 1, 2001, Favre signed a "lifetime" contract extension, which technically was a 10-year contract extension worth around $100 million. Favre and the Packers continued posting positive results through the next few seasons. Through the 2004 season, the Packers had the longest streak of non-losing seasons (13) in the NFL, despite an 8–8 record under head coach Ray Rhodes, a 9–7 season under head coach Mike Sherman, and no playoff berths in either 1999 or 2000. The streak ended in 2005, with the Packers finishing with a 4-12 record. One day after his father died of a heart attack or stroke, Favre decided to play in a December 22, 2003, Monday Night Football game against the Oakland Raiders. The Packers traveled to Oakland where Favre passed for four touchdowns in the first half and 399 total yards in a 41–7 victory over the Raiders on international television (even receiving applause from "Raider Nation"). He completed 73.3% of his passes and finished the game with a passer rating of 154.9 with having recorded a perfect 158.3 rating with four touchdowns and over 250 yards passing by halftime (a feat accomplished by only four other passers in NFL history). Afterwards, Favre said, "I knew that my dad would have wanted me to play. I love him so much and I love this game. It's meant a great deal to me, to my dad, to my family, and I didn't expect this kind of performance. But I know he was watching tonight." After the game, he went to his father's funeral in Pass Christian, Mississippi. Favre won an ESPY Award for his Monday Night Football performance. Favre dropping back for a pass during the 2004 season. A notable game in the 2004 season in which Favre and the Packers finished 10–6 was against the New York Giants. During the game, Favre suffered a concussion. He did not receive medical clearance to re-enter the game. Despite the concussion, Favre threw a 28-yard touchdown to Javon Walker on a fourth down play. Afterwards it was reported that Favre did not remember throwing the touchdown pass. Favre also had two significant touchdown streaks of note during the season. He had completed at least one touchdown pass in 36 consecutive games over the 2002–2004 seasons which at the time was the second longest streak in NFL history. Also, during the 2004 post-season, he broke Dan Marino's record for consecutive games with at least one touchdown pass in the post season. After the death of his father, a series of events related to Favre's family were reported in the media. In October 2004, ten months after the death of Favre's father, his brother-in-law, Casey Tynes, was killed in an all-terrain vehicle accident on Favre's Mississippi property. 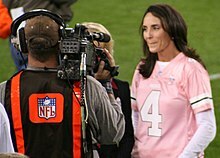 Soon after in 2004, Favre's wife, Deanna Favre, was diagnosed with breast cancer. Following aggressive treatment through 2004, she recovered. She created The Deanna Favre Hope Foundation which supports breast cancer education and women's breast imaging and diagnosis services for all women, including those who are medically underserved. In late August 2005, Favre's family suffered another setback: Hurricane Katrina blew through Mississippi, destroying his family's home there; however, none of his family members were injured. Brett and Deanna's property in Hattiesburg, Mississippi was also extensively damaged by the storm. Favre elected to continue to play in the 2005 season. For the 2005 season, the Packers, despite throwing for over 3,000 yards for a record 14th consecutive time, Favre had a below average season with only 20 touchdown passes and a league-leading 29 interceptions. The loss of guards Marco Rivera and Mike Wahle to free agency along with key injuries to Javon Walker, Ahman Green, Bubba Franks, among others, hampered Favre and the team. His passer rating was 70.9, 31st in the NFL and the worst single season rating of his career. After the disappointing season, many speculated that Favre would retire. However, on April 26, 2006, Favre announced that he would remain with the team for the 2006 season. Despite earlier comments that the 2006 season would be his last, Favre announced in a press conference on May 6, 2006, that he had not ruled out the possibility of returning beyond the 2006 season. In the 2006 season, Favre suffered his first career shutout against the Chicago Bears. Later in the season, the New England Patriots shut out the Packers in a game where he was injured before halftime and could not complete the game. On September 24, 2006, he became just the second quarterback in NFL history to record 400 touchdown passes (Dan Marino being the first). He connected with rookie wide receiver Greg Jennings on a 5-yard pass that Jennings turned into a 75-yard touchdown play during a win against the Detroit Lions. He also became the first player ever to complete 5,000 passes in his career. On December 31, 2006, the Packers played their last game of the season, winning 26–7 in the second game against the Chicago Bears. It was his 22nd career win versus the Bears, moving him to an all-time record of 22–8. On February 26, 2007, Favre underwent minor arthroscopic ankle surgery in Green Bay, Wisconsin to remove a buildup of bone spurs in his left ankle. Favre began the 2007 season trailing in a number of career NFL passing records. On September 16, 2007, Favre and the Packers defeated the New York Giants to give Favre his record setting 149th win, passing John Elway. On September 30, Favre threw a 16-yard touchdown pass to wide receiver Greg Jennings in a game against the Vikings. This was his 421st NFL touchdown pass, and set a new all-time record, surpassing Dan Marino's 420. On November 4, 2007, after the Packers defeated the Kansas City Chiefs 33–22, Favre became only the third quarterback to have defeated all thirty-one other current NFL teams. He joined Peyton Manning and Tom Brady as the only quarterbacks in NFL history to do this, just the week after the two of them achieved the accomplishment. On Thanksgiving 2007, Favre led the Packers to a 37–26 win over the Lions, and brought the Packers to a 10–1 record. He won the Galloping Gobbler award, given by the broadcasters at Fox to the game's MVP. Favre threw three touchdown passes for his 63rd career game with at least three touchdowns, surpassing Marino's former record of 62. Favre led the Packers to a 13–3 regular season record, the NFC North championship, and the second seed in the NFC playoffs. Prior to the Packers' playoff game against the Seattle Seahawks, Favre stated his desire to continue playing football for another season. In the Divisional Playoffs, Favre threw three touchdowns as the Packers cruised to a 42–20 victory over the Seahawks at a snowy Lambeau Field. The Packers' season ended the following week when they suffered a 23–20 overtime loss in the NFC Championship Game to the New York Giants (who in turn upset the heavily favored and previously undefeated New England Patriots in Super Bowl XLII). Negotiating sub-zero temperatures, Favre amassed 236 passing yards and two touchdowns, but also threw an interception in overtime that set up the Giants' game-winning field goal. Favre's 90-yard touchdown pass to wide receiver Donald Driver in the second quarter was the longest pass in Packers playoff history, and it extended Favre's NFL record for consecutive postseason games with a touchdown pass to 18. Favre stated after the game that he would make a decision more quickly than he has in the past regarding whether he would return for another season. 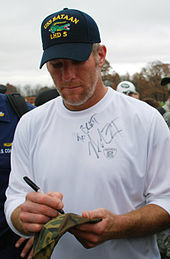 Favre's milestone 2007 season culminated with his selection to the 2008 Pro Bowl as the starting quarterback for the NFC, but an ankle injury forced him to withdraw from the game. Beginning near the end of the 2006 season, word began to surface that Favre was considering retirement. In fact, playing in Soldier Field against the arch-rival Bears in the season finale, Favre was given a standing ovation in the closing seconds of the Packer victory as a show of respect from Chicago fans to their longtime nemesis. Moments later at the postgame interview, he gave a tearful interview with an NBC Sports correspondent, where he admitted his future was still questionable. However, after much debate, he returned for the 2007 season, during which his future was once again in doubt and an oft-discussed topic, with many in the media speculating that if the Packers made the Super Bowl, Favre would indeed retire and hand the reins to the unproven but talented Aaron Rodgers, who was drafted two years earlier as Favre's heir-apparent. Ultimately, the Packers fell in the NFC Championship to the New York Giants. According to Bob McGinn in the Journal Sentinel, after the conclusion of the 2007 season, "Just about everyone who counted in the football department reached the conclusion that Favre could never win another championship. His dismal playoff record in the past decade couldn’t be overlooked. And the Packers concluded that it would be the mother of all mistakes if Aaron Rodgers got away without being properly evaluated as a starter. Favre had one chance, and one chance only, to salvage his career in Green Bay. He had to commit wholeheartedly for another season by early March. One could argue that the Packers erred by asking Favre for an answer that early. But having been hung out to dry by Favre too often in the past, they were in no mood for drama." There was also miscommunication between the Packers and Favre, as admitted by General Manager Ted Thompson, "when Favre decided in March that he was leaning toward playing, the organization wasn't quick toward embracing him". On March 4, 2008, Favre formally announced his retirement. Although Favre stated that he had been willing to play another year, he felt that another season would only be successful if he led his team to another Super Bowl victory. He added the chances for a Super Bowl win were small, and that he was not up for the challenge. At his press conference, Favre openly wept about leaving the NFL. He stated that his decision, regardless of what was being said in the media, had nothing to do with what the Packers did or didn't do. Seeming to contradict statements made by his agent, Bus Cook, Favre said that his decision to retire was based on the fact that he did not want to play anymore. He said during the conference, "I know I can play, but I don't think I want to. And that's really what it comes down to." On July 2, 2008, it was reported that Favre was in contact with the Packers about a possible return to the team. On July 11, 2008, Favre sent a letter to the Packers asking for his unconditional release to allow him to play for another NFL team. Packers general manager Ted Thompson announced he would not grant Favre an unconditional release and reaffirmed the organization's commitment to Aaron Rodgers as its new quarterback. Complicating matters was Favre's unique contract giving him the leverage to void any potential trade by not reporting to the camp of the team he might be traded to if the Packers elect to go that route. Favre spoke publicly for the first time about his potential comeback in a July 14, 2008, interview with Greta Van Susteren on the Fox News Channel's On the Record with Greta Van Susteren. In the interview, Favre said he was "guilty of retiring early", that he was "never fully committed" to retirement, and that he was pressured by the Packers to make a decision before the NFL Draft and the start of the free agent signing period. Favre disputed the notion that he does not want to play for Green Bay and said that while he understands the organization has decided to move on, they should now allow him to do the same. He made clear that he would not return to the Packers as a backup and reiterated his desire to be released rather than traded, which would allow him the freedom to play for a competitive team. Favre also accused the Packers of being dishonest, wishing the team would have been straightforward with him and the public. In the second part of the interview, which aired on July 15, Favre expressed his frustration with Packer management, spoke of his sympathy for successor Aaron Rodgers's predicament, and affirmed he is 100 percent committed to playing football in 2008. FOXSports.com's Jay Glazer reported on July 16, 2008, that the Packers filed tampering charges against the Minnesota Vikings with the league office, alleging improper communication between Vikings offensive coordinator Darrell Bevell and Favre, although one source suggested that Favre may have been in contact with Vikings head coach Brad Childress. After an investigation, NFL Commissioner Roger Goodell ruled there had been no violation of tampering rules. Packers team president Mark Murphy met with Favre on July 30 in Hattiesburg, Miss. with the offer of a $20 million marketing agreement, which was "viewed nationally as a bribe to get Favre to stay retired". Favre formally filed for reinstatement with the NFL on July 29, 2008, and his petition was granted by Commissioner Goodell, effective August 4, 2008. Favre then flew to Green Bay to report to Packers training camp. After a lengthy meeting with head coach Mike McCarthy and general manager Ted Thompson, however, both sides agreed it was time for Favre and the organization to part ways. McCarthy sensed Favre was not in "the right mind-set" to resume playing for the Packers, while Favre felt that his relationship with Packer management had deteriorated to the point that a return to the team would be untenable. 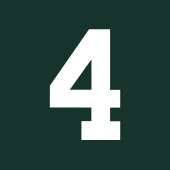 The Packers had announced plans to retire Favre's #4 jersey in the 2008 season opener. Those plans were dropped when he announced plans to return to the NFL. 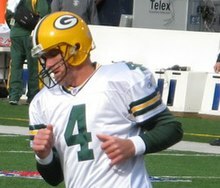 In March 2009, the Packers indicated that the team still intends to retire Favre's number, but due to the circumstances surrounding his departure from the team, no timeline had been set. After negotiations with both the Tampa Bay Buccaneers and New York Jets, the Packers traded Favre to the Jets on August 7, 2008, in exchange for a conditional fourth-round pick in the 2009 NFL Draft with performance escalation. Favre's season with the Jets started well; in Week 4 of the 2008 season, he threw six touchdowns against the Arizona Cardinals, a personal best and one shy of the NFL record. This performance led to him being selected as the FedEx Air Player of the Week. By Week 12, the Jets had compiled an 8–3 record, including a win over the previously undefeated Tennessee Titans. However, the Jets lost four of the last five games of the season, including the final game against AFC East divisional opponent Miami, who had acquired quarterback Chad Pennington after he was released from the Jets to make room for Favre. In those five games, Favre threw eight interceptions and only two touchdown passes, bringing his season total to twenty-two of each. Favre had complained of shoulder pain and had an MRI performed on December 29, 2008, which revealed a torn biceps tendon in his right shoulder. After the 2008 season had ended, in mid January 2009, Favre told Jets General Manager Mike Tannenbaum, "it may be time to look in a different direction" regarding the quarterback position. On February 11, 2009, Favre informed the Jets that he was retiring after 18 seasons. He remained part of the Jets organization until April 28, 2009, when the Jets released Favre from his contract, thus allowing him to sign anywhere he wanted. By May 2009, he was officially cut from the Jets Reserve/Retired list. In September 2009, Favre again made Jets news, as the NFL learned that the Jets were aware that Favre injured his arm in the eleventh game of the 2008 season, and fined the Jets $125,000 for not reporting the injury in any of the Jets' five final games. 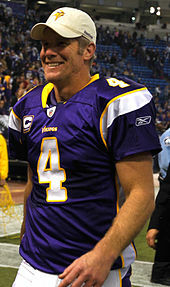 After an offseason of speculation, Favre officially signed with the Minnesota Vikings on August 18, 2009. He would go on to have a landmark season in which he surpassed former Vikings defensive end Jim Marshall for consecutive starts at one position, with 291, became the first quarterback in NFL history to defeat every one of the league's 32 franchises since the NFL first expanded to 32 franchises in 2002, surpassed Dan Marino's previous record for four-touchdown games, and was named to his 11th Pro Bowl. The Vikings finished 12-4 and advanced to the NFC Championship game, ultimately losing in overtime to the eventual Super Bowl XLIV champion New Orleans Saints. Despite the loss, Favre set playoff records for pass completions and passing yards previously held by Joe Montana. On August 3, 2010, NBC Sports reported the confirmation of Favre returning to the Vikings but saying that the 2010 season would be his final season. An announcement was given on August 17, 2010 confirming his return to the team. That season, Favre achieved two milestones. He threw for his 500th touchdown and 70,000th yard against the New York Jets. On November 7, 2010, in a game against the Arizona Cardinals, Favre threw for a career-high 446 yards while rallying the Vikings from a 14-point fourth quarter deficit to win in overtime. On December 5, 2010, in a game against the Buffalo Bills, Favre was hit by Bills linebacker Arthur Moats while making a throw, causing him to sustain a sprain of the AC joint in his right shoulder. Favre missed the rest of the game and was replaced by Tarvaris Jackson, who helped lead the Vikings to victory despite throwing three interceptions. On December 13, 2010, due to his sprained shoulder, Favre was marked inactive for the game against the New York Giants ending his consecutive regular season start streak at 297. Favre started a total of 321 games including post-season appearances. On December 20, 2010 while playing the Chicago Bears outside at TCF Bank Stadium due to the collapse of the roof of the Hubert H. Humphrey Metrodome, Favre sustained a concussion after being sacked by Bears defensive end Corey Wootton. As a rattled Favre was helped to his feet by Vikings' athletic trainer Eric Sugarman, he asked, "Suge, what are the Bears doing here?". This would be his final appearance in an NFL game. On January 2, 2011, Favre was unable to play against the Detroit Lions in the final game of the regular NFL season due to his inability to pass NFL-mandated post-concussion tests. In a press conference immediately following the game, Favre announced his intention to retire from professional football. On January 17, 2011, Favre officially filed his retirement papers with the NFL. In 2013, Favre was asked to consider returning to the NFL to play for the injury-plagued St. Louis Rams. He turned down the offer, telling WSPZ radio in Washington, D.C. that he has suffered memory loss and that he feared it was related to the multiple concussions he suffered throughout his career. He was previously asked in a 2009 interview with NBC how many times he had played with a concussion that with the new standards would have resulted in him sitting out. 'A lot', he replied. Favre was the analyst for his alma mater, Southern Miss, when they played the Rice Owls on October 1, 2011. He later joined the NFL Network for pregame coverage of Super Bowl XLVII. It has also been reported that Favre has turned down repeated offers from the NFL Network to become an on-air analyst. For a more detailed list, see List of career achievements by Brett Favre. 3× Associated Press Most Valuable Player (MVP) (1995, 1996, and 1997; the last shared with Barry Sanders). 6× First- or Second-team All-Pro selection. Named to the NFL 1990s All-Decade Team. Favre was inducted by the Green Bay Packers into the team Hall of Fame in July 2015. On February 6, 2016, Favre was elected into the Pro Football Hall of Fame as a member of the class of 2016. In addition, he has been honored by several organizations including Men's Health Magazine, Sports Illustrated, Make a Wish Foundation, and United States Sports Academy. 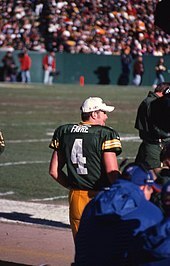 Favre owns a number of team records, including having printed his name into almost every passing category in the annals of Green Bay Packers history. Favre is the holder of several firsts in NFL history, including the only quarterback to win three consecutive NFL most valuable player awards, first quarterback to defeat every one of the league's 32 franchises, and the first quarterback to win a playoff game over age 40. In addition, Favre set a number of college records with Southern Mississippi. Since first being named the starter of the Green Bay Packers before playing the Pittsburgh Steelers on September 27, 1992, Favre had never missed a game spanning over 18​1⁄2 consecutive seasons. He holds the record for the most consecutive starts by any player in the NFL with 297 (321 including playoffs), which is one of four quarterback streaks of at least 200 consecutive games in NFL history. Favre has stated that of all the records he set, he is most proud of the consecutive starts accomplishment. 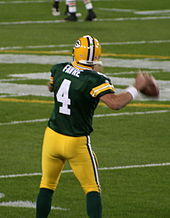 Favre failed to finish a game due to injury on only eight occasions since taking control of the Packers as quarterback. Significant injuries suffered by Favre during the streak includes a first-degree shoulder separation, deep thigh bruise, severely bruised left hip, severely sprained left ankle, wind knocked out coupled with coughing up blood, sprained right thumb, right elbow tendinitis, left mid-foot sprain, sprained lateral collateral ligament of the left knee, broken left thumb, softball-sized bruise of the left hamstring, mild concussion, sprained right hand, injured ulnar nerve of the right elbow, bone spurs on the left ankle, torn right biceps, pulled groin, stress fracture of the left ankle coupled with an avulsion fracture of calcaneus, and a sprained sternoclavicular joint of the right shoulder. During Favre's consecutive starts streak, 238 other quarterbacks have started in the NFL, 17 of them being back-ups to Favre at one point. The Pro Football Hall of Fame has as an exhibit displaying the jersey Favre wore during his record-breaking 117th consecutive start as a quarterback, and a section of their website devoted to what the Hall of Fame calls an "Iron man". In 2009, Favre surpassed defensive end Jim Marshall for starts at any position with his record-breaking 271st start as a quarterback as the Vikings played the Lions. His streak ended at 297, with the last start in the streak coming on December 5, 2010 against the Buffalo Bills. Favre was unable to start the Vikings' December 13 game against the New York Giants due to a shoulder injury, despite the game being delayed for a day because of the collapse of the Metrodome roof. 2002: In September, sportswriter Peter King conducted an interview with Favre during spring training. Favre told him that he missed home and was thinking more and more about retirement. When then–head coach Mike Sherman told the players they could have off on Saturday and Sunday, Favre replied "I wish I could be on my lawn mower back home." 2003: Favre was constantly asked about retirement throughout the early part of the year. Favre jokingly responded by saying "I can't even remember how the whole retirement thing started, but whoever started it needs to be shot." 2005: After the Packers got off to a slow start, rumors that Favre might retire started to escalate. Favre responded by saying "At 0–3, I think most people would say 'Oh, he's gone after this year, or they won't even want him back. '...I don't even think about when that time might come." 2006: In an interview with ESPN in January, after the Packers had finished with a 4–12 record, Favre admitted that if he had to make a decision right away he would not come back. He went on to say "There's other days, I go, 'What if it's crunch time, two minutes left, do you want the ball?' I don't know if I do." In March, Favre hears Phil Simms say on Sirius Radio that as long as Favre can physically play the game, he should. Shortly thereafter, Favre confirms he would return to play. After the Packers defeated the Chicago Bears the last game of the season 26–7, Favre choked up during an interview with Andrea Kremer by saying "If today's my last game, I want to remember it. It's tough. It's tough. I'll miss these guys. I'll miss this game. I just want every one to know that...I didn't plan on doing this. Way to put me on the spot." Asked if he was indeed going to retire, Favre responded "We'll see. We'll see. I don't want to say anything right now." After the game, a Packers teammate said that Favre was just as emotional in a speech after the Seattle Seahawks game in 2005 at Lambeau Field when he was all but certain he was going to retire. 2007: In February, Favre told the Biloxi Sun Herald that he plans to come back for another season with the Packers. 2008: In early March, Favre announced that he is retiring from the Green Bay Packers. At a news conference he said "I know I can play, but I don't think I want to. It's been a great career for me, but it's over. As they say, all good things must come to an end. I look forward to whatever the future may hold for me." Later in the month Favre has second thoughts and wants to return. According to the Milwaukee Journal Sentinel, Favre backed out of a meeting with Packers management two days before re-entry talks were to begin. In April, Sam Farmer from the Los Angeles Times reported that Favre's agent Bus Cook was making inquiries to other teams about Favre. Favre responded by saying "I have no idea where that came from, but it certainly didn't come from me. I'm happy about my decision and I haven't once said 'I wonder if I made the wrong decision.' I know it's the right one. It's kind of funny. Even when I'm retired, they won't let me stay retired." Also in April, the Packers placed Favre on the Reserve-Retired list and planned to have Favre's number retired during the season opener against the Minnesota Vikings. In June, Favre said he told head coach Mike McCarthy he wanted to come back to the team. He said "When he picked up the phone again after he dropped it, he said, 'Oh, God, Brett. You're putting us in a tight spot. He said, 'Brett, playing here is not an option.' Those were his exact, exact words." In July, Favre sent a letter requesting his release from the Packers. A couple months earlier Favre contacted Mike McCarthy about coming out of retirement and was "rebuffed" according to a Milwaukee Journal Sentinel report. Then a report came in from ESPN that said that Favre had wanted to come out of retirement but the Packers were reluctant to take him back. The Packers refused to give Favre an unconditional release. A few days later, Favre had an interview with Greta Van Susteren of Fox News where he accused general manager Ted Thompson of forcing him to make a decision on his return to the team too quickly. Two days after the interview, the Packers filed tampering charges with the NFL front office charging that the Minnesota Vikings had inappropriate contact with Favre. The Packers then offered Favre a retirement package of $25 million marketing agreement to remain retired. This offer was rejected and Favre was subsequently traded to the New York Jets. 2009: In February, Favre said he retired although his agent Bus Cook asked for his release from the New York Jets. After the Jets released him in April, Bus Cook e-mailed Jarrett Bell of USA Today that "He's retired, working on his farm in Mississippi." In May, Minnesota Vikings head coach Brad Childress set up a meeting with Favre to discuss him possibly playing with the team. In July, Childress said Favre would not be coming out of retirement. However, in August Favre announced he would come back and play for the Vikings. 2010: On February 7, Favre appeared in a second quarter Super Bowl XLIV ad for Hyundai parodying his retirement indecisiveness. In the ad, set after the 2020 NFL season, a grayed 50-year-old Favre accepts the season MVP award and ponders retirement, but cannot commit one way or the other. In April, Favre indicated that if it were not for his Vikings teammates and fans, it would be easy to retire. In early August, Favre's ankle (which was injured during the 2009 playoffs) had not responded after surgery and rehabilitation. As a result, he informed the team that he would not be coming back for another season. However, two weeks later he told teammates Jared Allen, Steve Hutchinson and Ryan Longwell he was coming back for another season. 2011: In January, Favre filed retirement papers with the NFL. In December, a report from ESPN-Chicago indicated that Favre would be open to coming back from retirement if the Chicago Bears were interested. However, head coach Lovie Smith and Favre denied the report. Favre said "In spite of reports about playing with various teams, I'm enjoying retirement with my family and have no plans to play football." 2013: Favre's agent Bus Cook indicated early in the season that Favre could still play in the NFL. When asked about what his agent said, Favre responded "I am (in shape), but I am no way considering playing...The stress level was much, much more (when I played)....The demands are, don't get me wrong, I want to win, but it's not a job." A few weeks later, in late October, the St. Louis Rams called Favre after their starting quarterback Sam Bradford was lost for the season, but Favre declined their offer to bring him out of retirement. 2017: Following Aaron Rodgers breaking his collarbone Week 6 against the Vikings, former ESPN reporter Ed Werder asked Favre if he would come back for the rest of the 2017 season. "Absolutely not," Favre said. Favre married Deanna Tynes on July 14, 1996. Together, they have two daughters, Brittany (born 1989) and Breleigh (born 1999). While Favre was still playing, Brittany gave birth to his first grandchild. The NFL stated that at the time it did not know of any other active players with grandchildren. Favre's mother, Bonita, helps manage his holdings in agriculture and real estate, handle his endorsements and appearances, and oversee his charity work. Brett and Bonita Favre released a book in 2004 titled Favre (ISBN 978-1-59071-036-4) which discusses their personal family and Green Bay Packers family, including the Monday Night Football game that followed the death of Brett's father Irvin Favre. Favre's nephew, Dylan, played quarterback for the Cedar Rapids Titans of the Indoor Football League in 2016 after playing in college at Mississippi State, Pearl River Community College and the University of Tennessee-Martin. In 2012, Favre became the offensive coordinator for Oak Grove High School. Favre won his first game as part of the Oak Grove coaching staff by a score of 64–6. In December 2013, with Favre still serving as the offensive coordinator, Oak Grove High School won the Class 6A Mississippi high school state championship. In May 2014, it was announced that Favre would continue to help out at Oak Grove, but would no longer be offensive coordinator. Favre established the Brett Favre Fourward Foundation in 1996. In conjunction with his annual golf tournament, celebrity softball game and fundraising dinners, the foundation has donated more than $2 million to charities in his home state of Mississippi as well as to those in his adopted state of Wisconsin. Favre is involved with youth that are ill. Favre was awarded the Chris Greicius Celebrity Award from the Make a Wish Foundation. He is also known to respond to requests made to his foundation regarding youth with serious illnesses such as cancer. In 1999, Favre worked with NASCAR driver Dale Jarrett to operate Jarrett/Favre Motorsports in the Busch Series, which lasted two seasons. The Favre family owns and operates the Brett Favre's Steakhouse, located in Green Bay, Wisconsin. In 2013, Favre joined the Board of Directors of Sqor, a sport social media platform. Favre's role includes product ambassador, sports insights, and advising Sqor on business interests with teams, leagues and sports conferences. Favre made a cameo appearance in the 1998 romantic comedy film There's Something About Mary as Cameron Diaz's character's former love interest. Favre has been a spokesperson for multiple companies, including Nike, Snapper, Remington, Sears, Prilosec, Sensodyne, MasterCard, Wrangler, Bergstrom Automotive, and Hyundai. Prior to the Mississippi runoff election on June 24, 2014, Favre endorsed the incumbent Republican U.S. Senator Thad Cochran in his race against State Senator Chris McDaniel, a "tea party" favorite. In 1996, Favre was temporarily banned by the NFL from drinking alcohol after he admitted he was addicted to Vicodin and spent 46 days at a drug rehab clinic before the start of the season. His condition was serious enough that he suffered a potentially deadly seizure. In 2010, the NFL investigated Favre for allegedly sexting and leaving inappropriate voice messages for Jets "Gameday host" Jenn Sterger during the 2008 season. According to the NFL, forensic analysis failed to prove Favre sent the objectionable photographs to Sterger. Favre was found not to be in violation of the NFL's personal conduct policy, but was fined $50,000 for failing to cooperate with the investigation. ^ "Mind-blowing stats for Super Bowl XLIX". NFL.com. ^ "Favre Watch". Packers.com. Archived from the original on September 27, 2007. Retrieved February 8, 2007. ^ "Biloxi Daily Herald, October 15, 1969, Page 21". newspaperarchive.com. ^ Press, ed. (1989). "Folklife in the Florida Parishes". Louisiana Folklife Program, Division of the Arts, Office of Cultural Development, Department of Culture, Recreation, and Tourism. Retrieved July 13, 2017. ^ White, Beth, ed. (2016). "The Magnolia Duchess (Gulf Coast Chronicles Book #3): A Novel". Revell. ISBN 9781493401666. Retrieved July 13, 2017. ^ Favre, Beauregard (1990). Simon Favre and Pistikioknay. private. pp. 14–15. ^ "Mississippi Choctaw chief to speak at Brett Favre Day". Indianz.com. May 7, 2004. Retrieved February 8, 2007. ^ D'Amato, Gary (October 10, 2005). "Favre was toughened by brothers, dad". Milwaukee Journal Sentinel. Archived from the original on September 29, 2007. Retrieved February 8, 2007. ^ a b c Hanrahan, Phil (2011). Life After Favre: The Green Bay Packers and their Fans Usher in the Aaron Rodgers Era. Sports Publishing. ISBN 1613210205. Retrieved June 27, 2018. ^ a b D'Amato, Gary (October 17, 2005). "Favre caught on quickly in college". Milwaukee Journal Sentinel. Archived from the original on September 29, 2007. Retrieved February 8, 2007. ^ Traina, Jimmy (October 5, 2002). "Brett Favre Timeline". Sports Illustrated. Retrieved February 8, 2007. ^ "A visit with ex-Southern Miss QB Austin Davis at the NFL Scouting Combine". AL.com. ^ "2008 Southern Miss Football Media Guide" (PDF). Southern Miss Athletics. pp. 124, 128–129, 137. Retrieved July 25, 2008. ^ "Brett Favre". sports-reference.com. Sports Reference. Retrieved September 10, 2016. ^ "Brett Favre Biography". Wireimage.com. Archived from the original on February 5, 2007. Retrieved February 7, 2007. ^ "NFL Draft History – 1991". NFL.com. NFL Enterprises. Archived from the original on February 19, 2007. Retrieved February 16, 2007. ^ "ROUNDUP; Smerlas, Morris Try New Teams", The Washington Post, July 19, 1991. ^ a b D'Amato, Gary (October 24, 2005). "Trading places". Milwaukee Journal Sentinel. Archived from the original on September 29, 2007. Retrieved February 8, 2007. ^ a b c d e "This Day in Football: February 11". Nflfilms.nfl.com. February 11, 2012. Retrieved August 19, 2012. ^ "Brett Favre – Career Statistics". NFL.com. NFL Enterprises. Retrieved February 14, 2007. ^ Silverstein, Tom (August 17, 2005). "What, his hip? Favre reveals he has avascular necrosis". Milwaukee Journal Sentinel. Archived from the original on September 27, 2006. Retrieved February 8, 2007. ^ a b McGinn, Bob (November 5, 2005). "Year of great highs, lows". Milwaukee Journal Sentinel. Archived from the original on September 29, 2007. Retrieved February 8, 2007. ^ Glazer, Jay (August 6, 2008). "Packers trade Favre to Jets". Fox Sports on MSN. Archived from the original on August 19, 2008. Retrieved August 6, 2008. The month-long saga has finally come to an end, with the Packers agreeing to trade their future Hall-of-Fame quarterback to the New York Jets, FOXSports.com has learned. ^ Poliquin, Bud (July 13, 2015). "Ray Seals once again fails to hear the Greater Syracuse Sports Hall of Fame call his name". syracuse.com. Retrieved September 24, 2016. ^ "NFL Box Score for 9/13/1992". Databasefootball.com. Archived from the original on December 25, 2007. Retrieved February 7, 2007. ^ a b c d McGinn, Bob (October 1, 2005). "Favre bursts onto the NFL scene in 1992". Milwaukee Journal Sentinel. Archived from the original on September 29, 2007. Retrieved February 8, 2007. ^ "La Salle University article on Brett Favre". Lasalle.edu. Archived from the original on September 27, 2007. Retrieved February 24, 2007. ^ "1992 Green Bay Packers". Databasefootball.com. Archived from the original on February 6, 2007. Retrieved February 7, 2007. ^ "Brett Favre". Pro-Football-Reference.com. Archived from the original on May 14, 2011. ^ Nickel, Lori (October 8, 2005). "Packers roll dice". Milwaukee Journal Sentinel. Archived from the original on September 29, 2007. Retrieved February 8, 2007. ^ "Season-by-season log". pro-football-reference.com. Retrieved February 15, 2007. ^ Silverstein, Tom (October 15, 2005). "Favre seizes first MVP". Milwaukee Journal Sentinel. Archived from the original on September 29, 2007. Retrieved February 8, 2007. ^ "The NFL's Punitive Substance Abuse Policy". Treatmentonline.com. September 19, 2006. Archived from the original on August 5, 2007. Retrieved February 7, 2007. ^ D'Amato, Gary (October 22, 2005). "Drug abuse rocks his world". Milwaukee Journal Sentinel. Archived from the original on September 29, 2007. Retrieved February 8, 2007. ^ a b McGinn, Bob (October 29, 2005). "Having the time of his life". Milwaukee Journal Sentinel. Archived from the original on September 29, 2007. Retrieved February 8, 2007. ^ "Young stuns Packers with amazing TD pass in final seconds". CNNSI.com. January 4, 1999. Retrieved January 21, 2010. ^ "National Football Conference Champions". ESPN.com. Retrieved January 21, 2010. ^ "Record and Fact Book: The Definitive Source for NFL Information". NFL.com. NFL Enterprises. Retrieved November 15, 2006. ^ "Michael Strahan on NFL sack record: If you don't like it, break it". NFL.com. NFL Enterprises. October 16, 2013. Retrieved October 16, 2013. ^ "Contract sets Favre for life". Journal Sentinel Inc. Archived from the original on November 1, 2007. Retrieved November 15, 2006. ^ Jones, Al (December 21, 2003). "Favre's Father Dies At 58". Packers.com. Associated Press. Archived from the original on May 13, 2006. Retrieved February 8, 2007. ^ "Brett Favre: Game Logs". NFL.com. NFL Enterprises. Retrieved November 4, 2013. ^ "Packers-Raiders Recap". Packers.com. December 14, 2003. Archived from the original on March 8, 2005. Retrieved February 8, 2007. ^ "The 2004 ESPY Awards winners". ESPN.com. December 25, 2003. Retrieved December 12, 2006. ^ "11 amazing facts about Nick Foles' touchdown bonanza - For The Win". For The Win. ^ Borzi, Pat (October 4, 2004). "Favre's Concussion Adds to Packers' Woes". The New York Times. Retrieved October 22, 2008. ^ "Favre's amazing streak ends at 36". ESPN. Retrieved March 26, 2018. ^ "Mark for consecutive playoff games with TD pass". ESPN. Retrieved March 26, 2018. ^ a b Weisman, Larry (October 19, 2005). "Deanna Favre gives Green Bay another reason to cheer". USA Today. Retrieved February 8, 2007. ^ D'Amato, Gary (August 13, 2005). "Packers feel the effects of Katrina". Milwaukee Journal Sentinel. Archived from the original on September 29, 2007. Retrieved February 8, 2007. ^ "Favre's family home destroyed, Packers say". MSNBC. Associated Press. August 31, 2005. Retrieved September 17, 2007. ^ "NFL Passing Stats 2005". ESPN.com. Retrieved December 12, 2006. ^ "Favre says he's leaning toward retirement". ESPN.com. January 30, 2006. Retrieved February 8, 2007. ^ "Favre to play '06 season for Packers". ESPN.com. April 26, 2006. Retrieved February 8, 2007. ^ "Favre, Packers shut out by Bears 26–0". NFL.com. NFL Enterprises. September 10, 2006. Archived from the original on May 17, 2007. Retrieved February 8, 2007. ^ McGinn, Bob (November 12, 2006). "A painful lesson". Milwaukee Journal Sentinel. Archived from the original on February 21, 2007. Retrieved February 8, 2007. ^ Braun, Rick (December 27, 2006). "The 400 Club: Favre joins Marino's class". Milwaukee Journal Sentinel. Archived from the original on September 29, 2007. Retrieved February 8, 2007. ^ "Favre has ankle surgery; Garcia shunned". The Japan Times Online. February 28, 2007. Archived from the original on June 7, 2011. Retrieved December 30, 2010. ^ Tucker, Doug (November 4, 2007). "Green Bay improves to 7–1". Associated Press. Archived from the original on November 5, 2007. Retrieved November 4, 2007. ^ "Favre completes 20 straight passes as Packers light up Lions". ESPN.com. Retrieved November 23, 2007. ^ Jones, Al (January 10, 2008). "Favre indicates he's looking toward another season, Sun Herald reports". KansasCity.com. The Kansas City Star. Archived from the original on January 21, 2008. Retrieved January 10, 2008. ^ "Manning, Giants head to Super Bowl for rematch with Pats". ESPN.com. Retrieved August 2, 2008. ^ "Brett Favre Has Minor Ankle Surgery". CBS News. February 26, 2007. ^ Walker, Don (March 4, 2008). "Favre retiring, Fox Sports reports". Milwaukee Journal-Sentinel. Archived from the original on February 16, 2008. Retrieved March 4, 2008. ^ "Brett Favre Set to Retire After 17 Years". Google. Associated Press. March 4, 2008. Archived from the original on March 9, 2008. ^ a b "Statement From Packers General Manager Ted Thompson". March 4, 2008. Archived from the original on December 30, 2008. ^ Mortensen, Chris (July 2, 2008). "Favre has 'itch' to ditch retirement, report to camp". ESPN.com. Retrieved July 2, 2008. ^ "Favre seeks unconditional release from Packers, sources say". ESPN. July 11, 2008. Retrieved July 11, 2008. ^ "Packers GM, coach say team won't release Favre despite request". ESPN.com. July 13, 2008. Retrieved July 16, 2008. ^ Jenkins, Chris. "Favre Says He's Tempted to Show Up at Packers Camp". The Washington Post. ^ "Favre now owns a unique no-trade clause". NFL.com. NFL Enterprises. July 15, 2008. Retrieved July 22, 2008. ^ "Favre to Fox News: Packers should let me play elsewhere". ESPN. July 14, 2008. Retrieved July 14, 2008. ^ "Favre shares his side of the story in Fox News interview". CNNSI.com. July 14, 2008. Archived from the original on July 17, 2008. Retrieved July 14, 2008. ^ "Exclusive: Brett Favre on His Packer Replacement and Playing Again". FoxNews.com. July 15, 2008. Archived from the original on July 20, 2008. Retrieved July 16, 2008. ^ Glazer, Jay (July 16, 2008). "Source: Packers say Vikings tampered with Favre". FOXSports.com. Archived from the original on January 16, 2009. Retrieved July 16, 2008. ^ "Vikings refuse to address Packers' claims of Favre tampering". ESPN.com. July 17, 2008. Retrieved July 17, 2008. ^ Krawczynski, Jon (August 4, 2008). "Goodell says Vikings didn't tamper on Favre". Yahoo! Sports. Archived from the original on July 23, 2008. Retrieved August 6, 2008. ^ "NFL grants Favre reinstatement; sources say QB job is open". ESPN.com. August 3, 2008. Retrieved August 3, 2008. ^ "Sources: Favre has spoken to Bucs and Jets as potential trade suitors". ESPN.com. August 5, 2008. Retrieved August 6, 2008. ^ Favre's No. 4 to become sixth number retired by Packers Archived November 6, 2012, at the Wayback Machine from NFL.com. Obtained April 3, 2009. ^ Favre's No. 4 to be retired, but Packers will wait for ceremony Archived October 15, 2012, at the Wayback Machine from CBSSports.com. Obtained April 3, 2009. ^ "Favre's next team may be Bucs or Jets". The Denver Post. August 7, 2008. Retrieved April 3, 2010. ^ Waszak, Dennis Jr. (August 6, 2008). "Favre's 6 TD passes lead Jets past Cardinals 56–35". Associated Press. Archived from the original on October 1, 2008. Retrieved September 28, 2008. ^ "Brett Favre 2008 statistics". NFL.com. NFL Enterprises. Retrieved April 3, 2010. ^ "Report: Favre told Jets to 'look in different direction'". ESPN.com. January 4, 2009. Retrieved January 3, 2009. ^ "Favre to call it quits – again – after 18 seasons". NFL.com. February 11, 2009. Retrieved February 11, 2009. ^ Graham, Tim (April 28, 2009). "Jets release Favre, clear way for possible return – AFC East Blog – ESPN". Myespn.go.com. Archived from the original on May 2, 2009. Retrieved April 3, 2010. ^ "Jets fined $125,000 for not reporting Favre Injury". Newsday.com. September 16, 2009. Retrieved April 3, 2010. ^ "Green Bay Packers vs. Minnesota Vikings – Recap – October 05, 2009 – ESPN". Sports.espn.go.com. Retrieved April 3, 2010. ^ "2010 Pro Bowl rosters". December 29, 2009. Archived from the original on January 2, 2010. ^ "Saints edge Vikings to reach first Super Bowl". Reuters. January 24, 2010. Retrieved January 24, 2010. ^ "Favre left limping away from another title game loss; future unclear". NFL.com. January 25, 2010. Archived from the original on January 27, 2010. Retrieved January 26, 2010. ^ "Report: Favre to confirm return Tuesday night". NBC Sports. August 17, 2010. ^ Wetzel, Dan. "Favre faces age-old questions". Yahoo! Sports. Retrieved December 30, 2010. ^ "Favre throws TD No. 500 / Favre hits 70,000 yards". NFL.com. NFL Enterprises. October 11, 2010. Retrieved October 12, 2010. ^ "Favre's career-high 446 yards rally Vikes to OT win". CBSSports.com. November 7, 2010. Archived from the original on November 9, 2012. Retrieved December 30, 2010. ^ Copeland, Kareem (April 23, 2013). "Brett Favre: Final play was first time I was knocked out". NFL. Retrieved October 16, 2017. ^ Marvez, Alex (January 17, 2011). "Favre turns in retirement paperwork". Fox Sports. Retrieved January 17, 2011. ^ a b "Sunday Morning Quarterback: Brett Favre's memory loss puts a high-profile face on NFL's concussion problem". Daily News. New York. October 26, 2013. Retrieved November 24, 2013. ^ "Favre to be color analyst for Southern Miss game". NFL.com. ^ "Brett Favre joins NFL Network's Super Bowl coverage team". National Football League. Associated Press. January 30, 2013. Retrieved January 30, 2013. ^ "NFL Network "trying all the time" to get Brett Favre on the air". NBC Sports. August 29, 2013. ^ "Brett Favre Career Notes". ESPN.com. August 1, 2007. Retrieved March 12, 2009. ^ "Most Pro Bowls, By Position". Packers.com. December 20, 2006. Archived from the original on June 25, 2007. Retrieved December 20, 2006. ^ "Brett Favre statistics". Pro Football Reference. Archived from the original on May 14, 2011. Retrieved November 15, 2008. ^ "1990's All-Decade Team". NFL.com. NFL Enterprises. November 15, 2008. Retrieved November 15, 2008. ^ "Brett Favre praises staff and team at Packers Hall of Fame induction". Sports Illustrated. July 18, 2015. ^ Legwold, Jeff (February 6, 2016). "Brett Favre, Ken Stabler, Marvin Harrison among Hall's 2016 class". Retrieved February 6, 2015. ^ "Seven stats that put Brett Favre in a class of his own". ^ "NFL Games Started Career Leaders (since 1960)". Pro-Football-Reference.com. ^ a b D'Amato, Gary (November 28, 2004). "200 reasons to admire Favre". JSOnline.com. Milwaukee Journal Sentinel. Archived from the original on September 29, 2007. Retrieved July 26, 2007. ^ "Packers QB Rodgers out for season; Favre likely to play". ESPN.com. Associated Press. November 22, 2006. Retrieved November 1, 2010. ^ "Patriots rough up Favre, hold off Vikings for fifth consecutive win". NFL.com. Associated Press. October 31, 2010. Retrieved November 1, 2010. ^ "Minnesota Vikings lose Brett Favre to injury, but beat Buffalo Bills". The Saratogian. Associated Press. December 14, 2010. Retrieved December 14, 2010. ^ "How would Brett Favre's various injuries throughout his career affect you? – ESPN". ESPN.com. ^ "Favre's record streak ends in Vikings' loss to Giants". The Chicago Sun-Times. December 14, 2010. Retrieved December 14, 2010. ^ "Iron Man". www.profootballhof.com. November 30, 2004. Retrieved November 28, 2007. ^ Zulgad, Judd; Scoggins, Chip (September 20, 2009). "Favre's 271st consecutive start sets record". StarTribune.com. Archived from the original on September 25, 2009. Retrieved September 20, 2009. ^ "Brett Favre's consecutive starts streak ends at 297, tests due Tuesday". ESPN. December 14, 2010. Retrieved December 30, 2010. ^ a b c d e f g h i j k l m n o p q r "Tracking Favre's retirement(s)". Nbcsports.msnbc.com. Retrieved August 19, 2012. ^ a b c d e f g h "Timeline: Brett Favre's retirement drama since 2006". Usatoday.com. August 18, 2009. Retrieved August 19, 2012. ^ a b c d e f g h i "The Brett Favre Retirement Timeline". Nfl-facts-and-rumors.blogs.cbssports.com. August 3, 2010. Archived from the original on April 26, 2012. Retrieved August 19, 2012. ^ a b c d e f g h i j "Brett Favre Watch timeline". Sports.espn.go.com. August 17, 2010. Retrieved August 19, 2012. ^ "2010 Hyundai Super Bowl Ad "Brett Favre Retirement"". February 6, 2010. Retrieved January 10, 2015. ^ "Favre Submits Retirement Papers". Video.foxnews.com. January 17, 2011. Retrieved August 19, 2012. ^ "No comeback: Favre harbors 'no plans to play football' again". NFL.com. NFL Enterprises. December 7, 2011. Retrieved August 19, 2012. ^ "Brett Favre still could play in NFL, agent Bus Cook says". NFL.com. ^ "Brett Favre in great shape, not mulling NFL comeback". NFL.com. ^ "St. Louis Rams even called Brett Favre to replace Sam Bradford - ESPN". ESPN.com. ^ Difilippo, Bill (October 15, 2017). "Brett Favre Is 48, But He Still Got Asked If He'll Replace The Injured Aaron Rodgers". Uproxx. Retrieved October 16, 2017. ^ "Vikings' Favre welcomes grandchild". ESPN.com. ^ "NFL's all-time passing leader now a 'proud' grandfather". NFL.com. ^ Longman, Jere (January 19, 1997). "A Bayou Town Catches Favre Fever". The New York Times. Retrieved January 3, 2008. ^ Gutowski, Tim (November 9, 2004). "Bonita Favre Tackles Questions About Brett". OnMilwaukee.com. Retrieved January 3, 2008. ^ "Titans Sign Nephew of NFL QB Brett Favre". Indoor Football League. February 1, 2016. ^ "Agent: Favre will be assistant high school coach". usatoday.com. July 20, 2012. Retrieved August 19, 2012. ^ "Brett Favre wins in high school coaching debut". usatoday.com. August 18, 2012. Retrieved August 19, 2012. ^ "For Love of the Game". MMQB. December 10, 2013. ^ Caldwell, Stan (May 6, 2014). "Brett Favre taking on reduced role at Oak Grove". The Clarion Ledger. ^ "The Brett Favre Fourward Foundation". Retrieved February 7, 2007. ^ "Brett Favre's Steakhouse". Brett Favre's Steakhouse. Retrieved January 3, 2008. ^ "Brett Favre Named to Sqor Board of Directors". Marketwired.com. Retrieved February 20, 2016. ^ "The 20 Greatest Athlete Movie Cameos". Bleacher Report. August 17, 2010. ^ "20 Years of Brett Favre Endorsements: A Scorecard". Brandchannel.com. September 14, 2010. Retrieved August 19, 2012. ^ "Brett Favre turns out for Thad Cochran in new ad". politicalticker.blogs.cnn.com. Retrieved June 19, 2014. ^ "Favre: NFL Lied About Alcohol Ban Review". Los Angeles Times. August 13, 1997. Retrieved November 7, 2010. ^ Smith, Timothy W. (May 15, 1996). "PRO FOOTBALL;Favre Says He Abused Painkillers And Will Enter Treatment Center". The New York Times. Retrieved October 25, 2011. ^ "Dependence on painkillers brings Favre to a new low". Milwaukee Journal-Sentinel. October 22, 2005. Retrieved October 25, 2011. ^ "NFL probes allegations of Favre involvement with reporter". CBS Sports. Archived from the original on January 26, 2012. ^ Daulerio, A.J. (October 7, 2010). "Brett Favre's Cellphone Seduction Of Jenn Sterger (Update)". Deadspin. ^ a b "news: Favre fined $50K for 'failure to cooperate' with NFL investigation". NFL.com. NFL Enterprises. December 29, 2010. Retrieved August 28, 2011. 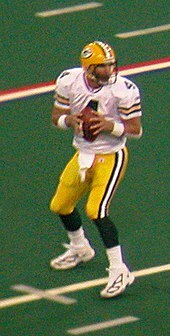 Wikimedia Commons has media related to Brett Favre.